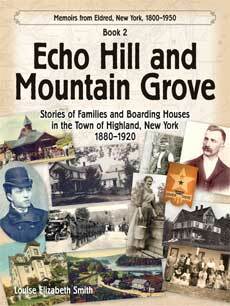 Echo Hill and Mountain Grove continues the story started in The Mill on Halfway Brook, in the Town of Highland, Sullivan County, New York, from 1880 to 1920. 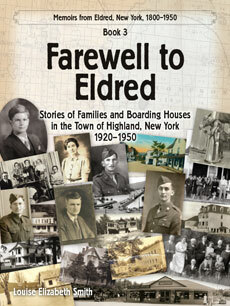 It is the second book in the series, Memoirs from Eldred, New York, 1800–1950. The narrative is an account of the change from lumbering, rafting, and bluestone quarrying, to that of running boarding houses in the picturesque hamlets of Barryville, Minisink Ford, Yulan, Eldred, and Venoge located near the Delaware River. Echo Hill and Mountain Grove tells the history of the Town of Highland and its townsfolk (Austin, Leavenworth, Eldred, Myers, Bodine, Bradley, Bosch, Clark, Gardner, Hallock, Mills, Boyd, Horton, Parker, Greig, Stege, Sergeant, Tether, and others), many of whom owned boarding houses. It includes visits to Colorado, Kansas, Nebraska, New York City, and France. Details on the Shohola Depot, Shohola Glen, Shohola House, the Pelton Soda Factory, the Roebling Bridge, the Congregational Church Centennial, Zane Grey, two presidential assassinations, and World War I, are a part of the story. You can also purchase Echo Hill and Mountain Grove by sending me a check for $39.95. Contact me at: info (at) halfwaybrook (dot) com for details. The Mill on Halfway Brook recounts the life and times of families who settled near Halfway Brook, in the heavily forested original Town of Lumberland, Sullivan County, New York. It spans the years 1800 to 1880, and is the first in the series, Memoirs of Eldred, New York, 1800–1950. The principal families in the book (Eldred, Austin, Leavenworth, and Myers) built their homes in what became the hamlet of Eldred, Town of Highland. Some of their friends and kinsfolk (the Clarks, Gardners, Hallocks, Hickoks, Sergeants, Van Tuyls, and others) lived in nearby hamlets (Barryville, Pond Eddy, Glen Spey, Narrowsburg, Tusten, or Bethel). The story includes references to the neighboring Pennsylvania towns of Shohola, Lackawaxen, and Mast Hope. 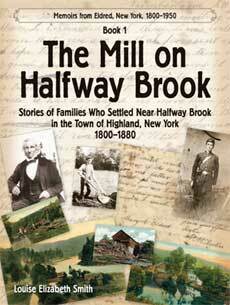 You can also purchase The Mill on Halfway Brook by sending me a check for $27.95. Contact me at: info (at) halfwaybrook (dot) com for details. 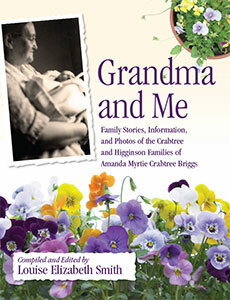 Amanda Myrtie Crabtree Briggs was born in 1891 in a sodhouse on her father’s Nebraska homestead farm. Over the years she told her children and grandchildren the stories of her growing up as well as those of her parents and her Crabtree and Higginson grandparents—real pioneers of the west. This book is a collection of those stories and includes almost 600 photos and documents. Aida A. Austin lived in New York City with or near her Eldred-Austin relatives during the winter months. In the summer, Aida and her New York City cousins travelled 95 miles to the village of Eldred, New York, and stayed with Aida’s parents, Henry and Mary Ann Eldred Austin. Aida wrote about the weather and daily life—plumbers fixing pipes, dentist and doctor visits, going to Central Park, skating, sailing, shopping, getting the mail, holidays, daily visits with relatives, President Garfield’s assassination, drinking tea, raking hay, and times with friends in Eldred (the Village) where she grew up. Included at the end of the Diary are photos of Aida’s parents, brothers, and some of her Eldred-Austin relatives mentioned in her diary. You can also purchase Aida Austin’s 1881 Diary by sending me a check for $12.95. Contact me at: info (at) halfwaybrook (dot) com for details. To subscribe to new post notifications, go to Comments page. The Mill on Halfway Brook is $27.95 including FREE SHIPPING. (Arizona residents: Please order from Amazon.) Please allow two weeks for delivery. Echo Hill and Mountain Grove is $39.95 including FREE SHIPPING. (Arizona residents: Please order from Amazon.) Please allow two weeks for delivery. Farewell to Eldred is $42.95 including FREE SHIPPING. (Arizona residents: Please order from Amazon.) Please allow two weeks for delivery. 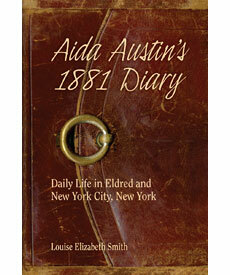 Aida Austin's 1881 Diary is $12.95 including FREE SHIPPING. Arizona residents please add 9% sales tax. GrandMa and Me can be purchased for $18.00 through Lulu.com.